Many people are fond of junk food (fast food) for various reasons, either because it feels, the process of presentation is fast, or because how to eat a simple. Foods such as pizza and hamburger are widely available in big cities, and the demand is also quite high. This is evidenced by the proliferation of fast food restaurants that stand in big cities around the world. Most junk food buyers like pizza and hamburgers are middle to upper class. And even many who become subscriptions or almost every day they consume these fast food. This time I will discuss about some of the bad effects of routine junk food or fast food. Junk food or fast food is a term to describe foods that are less healthy or even unhealthy because they have little nutritional or nutritional content. Low nutritional foods are also commonly called non-nutritional foods. Food junk food has a high fat content. Examples of junk food are pizza, hamburger, spaghetti, etc. As an example of eating junk food, I will take a pizza as an example. According to a study at Harvard Medical School states that pizza is made from processed grains, like pizza bread made from fine flour which is processed from grains. Eating processed grains such as those found in pizza can increase abdominal fat buildup. Excessive abdominal fat accumulation can increase your risk of developing diabetes, heart disease and breast cancer. On a pizza there is a large amount of cheese, cheese on this pizza contains high levels of saturated fat. Each 140 gr pizza cheese contains 18.5 grams of saturated fat, 28% higher than daily fat requirement. Especially when added with meat toping, then you will put more saturated fat into your body just by eating a pizza. Actually the benefits of cheese is very good for our health, if consumed with the correct number of servings (40 grams/day). Each 140 gr pizza cheese contains 675 milligrams of sodium (salt), or 29% higher than our daily sodium requirement. In order to avoid the negative effects of pizza and if you want to eat pizza should make yourself at home. You can use healthier ingredients to your taste, such as ginger flour, tomato sauce and salt to taste. Use a little cheese and multiply the vegetables. From the above explanation of course we can already guess kalu junk food is actually food that is not good for health. What are the effects of junk food for health? The bad impact of junk food first is to increase weight, as mentioned in the previous explanation that junk food is food that has high fat and calorie content. Often consuming and lack of exercise is a great combination to increase your weight significantly. If you frequently consume junk food, the more fat will accumulate in your body, and your automatic weight will also increase dramatically. The next bad effect of consuming junk food is to increase the risk of coronary heart disease (heart attack). 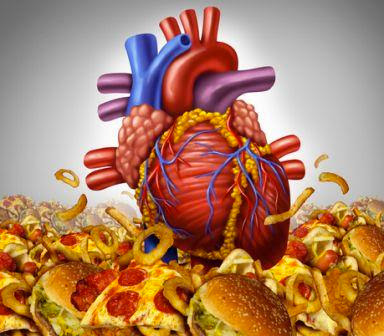 This heart disease is a disease that most often attacks them junk food enthusiasts. When the body receives many calories at the same time the body will be forced to produce large amounts of insulin to convert the incoming calories into blood sugar. The amount of insulin that is too much in the body will trigger the incorporation of fat and insulin that akibatanya can clog and damage the blood vessels. The habit of eating junk food or fast food can affect brain health and reduce the ability to think. A study revealed if the habit of consuming junk food especially since early age can make the level of IQ decreased. In addition, junk food enthusiasts are also vulnerable to brain diseases such as Parkinson's and Alzheimer's. Although practical and delicious, you should start now less or kalua can avoid the habit of eating junk food or fast food to avoid the brain disease. A study says that a person who likes to eat junk food and exercise less for 4 weeks tend to have liver enzyme changes. The enzyme changes also occur in people who often consume alcohol. This happens because of the trans fat deposits that are often found in junk food foods that result in liver organ failure function (liver dysfunction). Junk food enthusiasts will be more vulnerable to diabetes, due to the spike in blood sugar levels. This is because the large amounts of calories and fats that enter the body are converted by insulin into blood sugar which will then be distributed to cells to convert into energy. If the hormone insulin produced by the body can not offset the amount of sugar (glucose) in this blood can be the cause of diabetes. To overcome diabetes you can read the tips here. Consuming excess sodium may increase the risk of high blood pressure. The maximum limit for recommended sodium consumption is 2,300 milligrams. As explained by Hardvard Health Publication, the consumption of sodium in high amounts as found in junk food has the potential to increase high blood pressure, heart disease, liver and kidney. The last bad impact of junk food consumption is to make fans feel addicted. Whether or not this junk food diet contains addictive substances that can be anyone who consume them addicted. This addictive substance will stimulate the brain (desire) to frequently consume these junk food foods. This is what makes junk food enthusiasts difficult to switch to other healthier food menu such as fruits and vegetables. From now on reduce the consumption of junk food in excess because it can endanger your health. Begin a healthy lifestyle with a healthy diet, enough sleep do not stay up, regular exercise and avoid alcohol.